The main Accelerate title might be a bit ambiguous, but the sub-title of this Big Fish Audio sample library — Alternative & Indie Rock — hits the nail on the head pretty well. The library can be purchased in either a combi-WAV/REX/Apple loops format (which is what I had access to for the review) or as a Kontakt-ready package and, in both cases, what you are getting is 15 fully stocked construction kits, the main kit folders providing nearly 2.5GB of samples. Each kit features multiple song sections — intro, verse, chorus, outro and so on — so you can easily build a full arrangement and, within the main kit folders, the instrumentation is dominated by stereo drum loops, electric bass, lots of electric guitar loops and, for some of the kits, a collection of synth loops. As befits the musical style, the guitars are, in the main, suitably grungy and overdriven. However they might have been actually recorded, they capture the retro vibe of old amps in a live room very well indeed. As with the majority of BFA’s loop libraries, the material is very well organised and labelled, making it very easy to piece the appropriate loops together. For extra flexibility, in a separate folder (and containing a further 2.8GB of samples) is a full set of multi-miked drum recordings for each of the 15 main construction kits. These include multiple mics for kick and snare, hi-hat, tom, overheads, and room mics. In addition, if you happen to be a Logic, Pro Tools or Cubase user, then the WAV/REX/Apple Loops version of the library also includes pre-configured project files for each of the 15 construction kits: load one up into your favourite DAW/sequencer and get working. 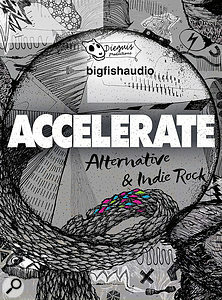 Accelerate’s blurb suggests the Queens Of The Stone Age, White Stripes, the Black Keys, Arctic Monkeys and Muse as being amongst the inspirations for these various kits. I’m less sure about the latter two, but the others are certainly in the right ballpark. This isn’t necessarily a complex musical style, but the bulk of the kits have just enough lo-fi and quirky elements to capture the right vibe. There are perhaps one of two of the kits that feel a bit like that album track you might choose to skip on an otherwise strong record, but it is all too easy to imagine that Josh Homme, Jack White or Dan Auerbach’s distinctive voices could elevate any of the rest into an indie rock classic. There perhaps isn’t anything radically new here in musical terms, but if you have a voice looking for an indie/alternative rock platform in which to shine, Accelerate might be just the thing.